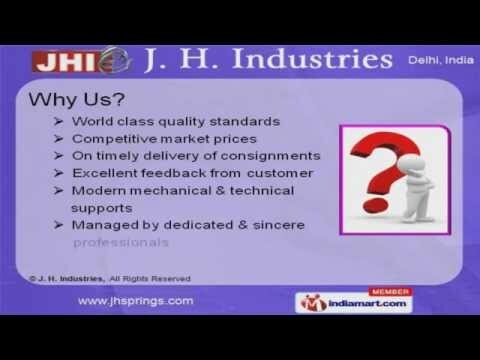 Welcome to J. H. Industries Manufacturer & Exporter of Industrial Springs. The company was incorporated in the year 1995. We cater to Automobile, Auto electrical & Electronics sectors across East Asia & South East Asia.World class quality standards, Competitive market prices, On timely delivery of consignments &Excellent feedback from customer are some of the key features of our organization.We are engaged in offering Compression, Extension, Torsion & Conical Spring.Our Oval Type, Wire Formings & Micro Compression Springs are a class apart.Along with that we provide premium grade Stainless Steel & Custom Compression Springs.Constant & Micro Extension Springs are some of our best selling products.Our Small & Custom Torsion Springs are widely acclaimed in market.We also offer Automotive & Customized Conical Springs.